Marc Jacobs Highliner Gel Crayon Eyeliner is a waterproof, long-wearing pencil eyeliner that promises intense color payoff. The formula combines the smoothness of a gel pot eyeliner with the convenience of a crayon. The texture is super-smooth and glides on easily offering flawless, precise application that sets in place for all-day wear. 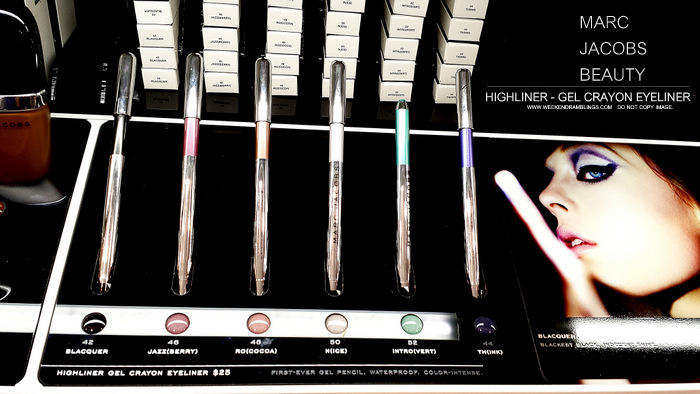 This crayon gel eyeliner is available in 6 richly pigmented shades, including Blacquer, the blackest, shiniest black. Scroll on for swatches. Of all the products I tried from the Marc Jacobs Beauty range, the Highliner Gel Pencil Eyeliner Crayons were easily my favorites. These twist-up pencils have a very smooth formula - really is like a gel liner but in a pencil form. And, these set in hardly any time and then don't budge. It was a struggle just to wipe off the swatches from my hand, though of course, a good makeup remover like the MUFE Sens'Eyes Waterproof makeup remover or an oil-based remover should be good at taking these off. I would have definitely bought at least one of these - still am quite tempted to - but I had promised myself "no more eyeliners" when I bought the Urban Decay liner vault. I can want all I want to, but I just have to draw the line at the nonstop buying this time.